This is a 360 assessment tool to use with the Creating a Culture. 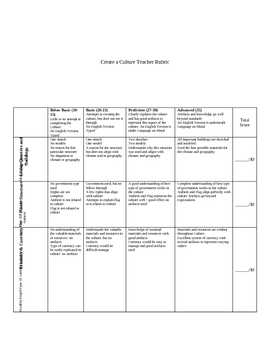 This tool includes a two page teacher rubric, peer evaluation form and questions/evaluations of parents, staff and administrators. After the students have created their culture then it is time to have a cultural museum and invite the parents, other teachers, and administrators. As the guests arrive, they are handed a set of question sheets. The object of these questions is twofold, first it is to hold the students accountable for their learning and second it will improve the overall experience of the guests. 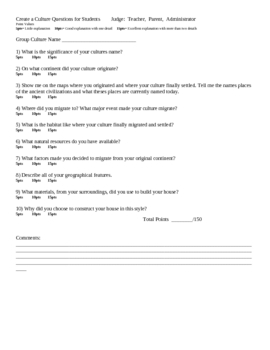 After the guests have made their way through the cultural museum, the teacher collects the question sheets and uses it as part of the assessment piece by taking an average of the scores. During the museum, the teacher is also evaluating the project using the rubric. After the museum is over, the students reflect on themselves and the contributions of their peers. All scores can be kept separate or they can be combined together into one score.